Family Sunday: Alice, Pink Floyd, or Cheers? What do Alice, Pink Floyd, and Cheers have in common? Vera. On Alice, there was a ditzy but lovable waitress named Vera. There is a Pink Floyd song entitled Vera. And, of course, on Cheers, Norm’s much-discussed but never-seen long-suffering wife was named Vera. There are other famous Veras: Vera Bradley, Vera Wang, and for tennis aficionados like myself, Vera Zvonereva. And now, in my life, there is our family’s new dog, Vera. Last Saturday, we went to a Basset Hound Rescue Adoption event. The Bassets were hidden in the back, but these extroverted dogs don’t hide. They come over to you, sniff you, and ask you where you’ve been all their lives. After all, you have hands, and hands are meant to pet them. The six of us arrived in their corner. That group included myself, my WH, teenaged Kath, tween MJ, and preschool twins, Cupcake and Chunk. Chunk was a particular sight to behold, so full of excitement, he bounced all around the store. He was lit up more brightly than he had been on Christmas morning when Santa brought him a watermelon. One dog did take a look at us and decide his life would be better without us. He found his foster family and situated himself far away from us. Three of the Bassets came over to sniff us. One of them rolled on her tummy and begged for attention. She wagged her tail and licked the kids. She had made up her mind that we were the family for her. I had my reservations. This Basset who kept my kids entertained was a senior Basset Hound, at least 8 years old. I went to the event looking for a younger dog. She started running circles around my preschoolers who were delighted with her. But did I mention she was eight? She lay down at the feet of my tween son and wagged her tail on his shoe. MJ was delighted with her. I kept paying attention to a younger Basset who licked my face. In the meantime, she rolled on her stomach for my husband and Kath who were now delighted with her. 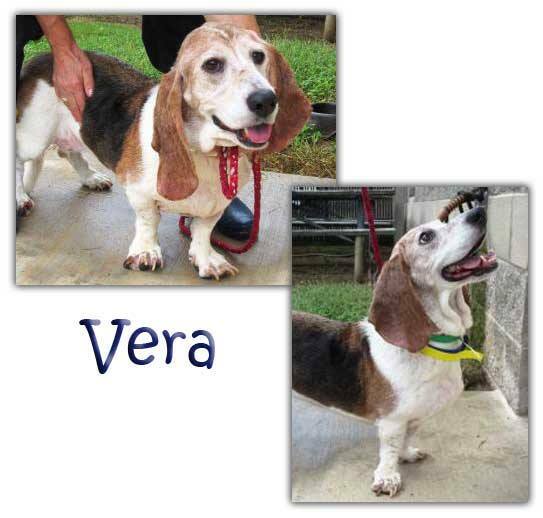 When my husband came over and asked if I’d made a decision, the younger Basset left and Vera followed my WH over and licked my face. She had made her decision, and we made ours. This sweet girl wanted a home, and our home wanted her. Vera came home with us. So Vera adopted us, and we listened to her. Just as I had to finally listen to my heart and take the plunge into writing. Just as this time of year so many people listen to themselves and resolve to do something to make this year different and special. Vera will sit in my lap and let me read if I use one hand to pet her while I read. I enjoyed reading some of Writing the Breakout Novel while Vera dozed on my lap. Even though she’s 38 pounds, she thinks she’s a lap dog, and I don’t have the heart to tell her otherwise. I don’t know how I’m going to write with her on my lap. I’ll be figuring that out in the weeks to come. Do you have a pet? How has he or she enriched your life? Let me know. Previous Previous post: Reading Wednesday: When Do You Read?